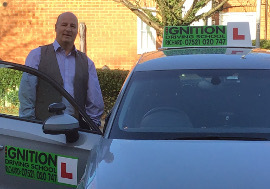 Ignition Driving School has been established for over 10 years and is now able to provide driving lessons in Basildon. Your Basildon driving lessons would be with a high grade driving instructor, in an automatic car, and all tuition would be one to one. Located 25 miles out of London, Basildon is the largest town in Essex, and is still growing in population due to the overcrowding in London's suburbs. Taking driving lessons in Basildon and passing your driving test would give you the independence and freedom to travel for work and social events. Ignition Driving School in Basildon offers an extensive range of driving courses, from standard driving lessons and refresher lessons to intensive driving courses, so no matter what level your experience is we are sure to have a course for you. At Ignition Driving School we work closely with the Driver and Vehicle Standards Agency (DVSA) to make sure that your Basildon driving lessons are to the highest possible standard. On your first driving lesson you will receive one of our information packs, detailing the process of learning to drive and about Ignition Driving Schools services. You can also continue to learn at home with our driving lesson aids, exclusively for Ignition Driving School's pupils. On our online pupil centre, The Hub, for example, you can practise theory papers and hazard perception clips, all for free! We also like to thank our pupils for recommending us to their friends and family, and so with our Ignition Driving School Loyalty Card, you can receive high street vouchers for helping us to keep busy! So you can learn to drive and treat yourself for all your hard work too! Richard is a fantastic driving instructor and also a very nice human being. I was such a nervous learner driver. I failed a few tests and changed driving instructor twice, I got lucky third time by finding him. He really did his best to overcome my fear. He was very patient and compassionate to my situation. He really disciplined me to do all the routines, he will push his students hard but only for our own good. He is a very innovative teacher. He sacrificed his time when he felt I needed more time. I cannot thank him enough for helping me the way he did. Because of him I actually started to enjoy driving! I will definitely recommend him as a driving instructor to everyone. I would like to say thank you from the bottom of my heart for all the support, patience, hard work and encouragement you have given me. For more information or to book simply click on one of the following links.